P0979. 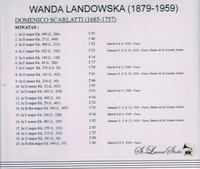 WANDA LANDOWSKA: Scarlatti Recital. (Canada) St Laurent Studio YSL 78-069, recorded 1939-40, Paris. Transfers by Yves St Laurent. "Almost needless to say, the playing is full of vigorous gestures and individual ideas. She was no respecter of text and there are little repeats here and there which are no more indicated than they are necessary. Yet such matters seem something of an irrelevance, since they only reflect an attitude of the time adopted by a celebrated pioneer of the harpsichord revival in the twentieth century. No, what charms me in Landowska's recital is her affecting poetic insight into Scarlatti's music; she is not just rediscovering the proper conjunction of composer and instrument, she believes in it and feels it intensely."